Steve Wellens - Secret Covert Hush-Hush White Space in the DOM…EXPOSED! Secret Covert Hush-Hush White Space in the DOM…EXPOSED! 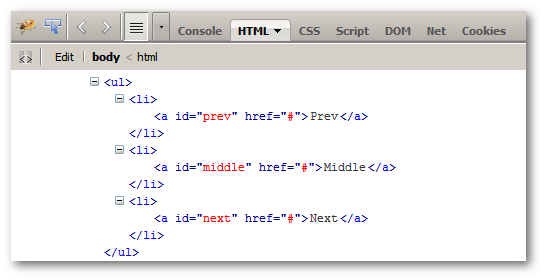 Next, he created a function to color the siblings of the middle element. When I debugged the code, I saw that nextSibling was returning an object that did not have a style property. What the heck was up with that? 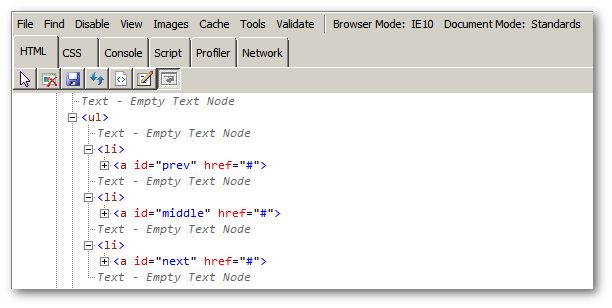 Hey, what the heck are those "Text = Empty Text Nodes" in the Internet Explorer window? What they are, my curious friend is the cause of the problem: nextSibling and previousSibling are returning Empty Text Nodes which do not have a style attribute. ALL three browsers have Empty Text Nodes. ONLY Internet Explorer displays them in its debugger. Internet Explorer is the best browser in this situation. So what are these Empty Text Nodes? And what is the fix? So, in addition to learning about white space nodes in the DOM, we learned that having multiple browsers installed can be a good thing.